ORC Services Inc. had over 1000 percent growth in 3 years. SEBASTIAN – ORC Services Inc., a 24-hour Disaster Clean-up and Reconstruction Company located on CR-512 (Sebastian Blvd), is one example of a locally-owned business soaring in Sebastian. In 2017, the company received an Inc. 5000 Award which honors extraordinary journeys of the fastest-growing companies in America. ORC Services Inc. was recognized because they had over 1000 percent growth over a 3-year period. You have to make over $2 million a year just to qualify for this award. They are insured and fully licensed to handle any situation. There’s no job to big or small. ORC can handle anything from minor leaks to reconstruction services. Their staff is certified to handle water damages, mold remediation, fire clean-up, and reconstruction services. “Our success came from doing what we promised. Our promise to complete our jobs with a small down payment equal to the customers deductible and get paid when they do from their insurance company,” said President, Adam Ogilvie. This 5-star company assigns project managers to handle all of the dreadfully paperwork of the mortgage company after the insurance company paid. “The reason we have 5 stars is because of our staff. We understand our customer doesn’t care what we know until they know we care. Almost all of our customers are dealing with a catastrophe and need caring to help top manage their unexpected situation.” Ogilvie said. “The customers don’t have to get a loan, max out credit cards or borrow from their families. We have completed project over 600k with only a 1k deposit and waited almost a year to get paid In full,” Ogilvie added. 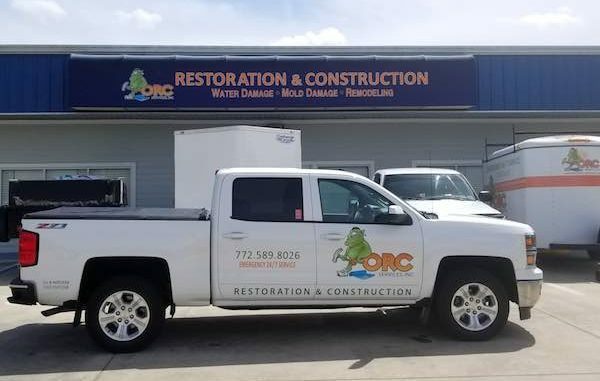 ORC Services Inc. can be reached by calling (772) 539-4860; they are located at 401 Sebastian Blvd Ste A, in Sebastian.